Which House Wins the Gold Medal? If you are a buyer the correct answer (simple version) is the one that gives you the most bang for your buck. Based on what you wanted and needed (location, school district, price range, number of bedrooms, number of covered parking spaces, etc.) You would first sit down and figure out what was it you needed (that you could afford). Then you go shopping. You want to only look at those homes that meet your specifications with regard to price range, and that have all (or at least a majority) of the features you really have to have. There are few “perfect homes” and there are usually going to be concessions. Few get everything they wanted. But most won’t settle unless they get most of what they wanted. In this market they don’t have to. So the buyer goes shopping and looking over the relevant properties in the area they want to live in they pick the one that gives them (when compared to all the others they could have purchased) the nicest house for the least amount of money. This is the system in use by home buyers today. It was the same system used by home buyers when I entered the business in 1978. I suspect it was the same system in use in 1958, as well. I am very confident it will still be the one used in 2058. Which one gives me the most for the least? If you are a home seller you have a huge advantage over the athletes who compete in the Olympics: you don’t have to beat out every other home seller around in order for you to completely win. All you have to do is to know (or hire someone who does) where the “water line” currently is for a house like yours. Fishing with your bait out of water makes little sense, just as pricing your home so low that you wind up leaving money on the table that could have been yours. No house is the “right house” for everyone. But any house – properly priced and properly marketed – can be the right house for someone. But that really isn’t the purpose at all. 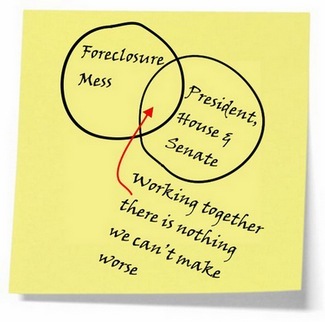 It is the Fannie Mae – Freddie Mac Bail Out Bill. That is why Bush signed it. He accepted all that other crap so he could do what he had to do to keep Fannie & Freddie afloat. Fannie & Freddie are the Big 2 of the secondary mortgage market. Most any lender (Bank of America would be an exception, Countrywide would not have been) would completely run out of money to loan in about 30 days. So the loans are packaged and sold to these two companies – who then go back to Wall Street again and again to replenish their money supply. What I don’t understand is why (in the final form it passed in) the National Association of Realtors backed it. Unless we are to assume that anything that gives any Realtor anything is “good” – no matter the cost, this one just makes no sense. The change that will hurt the Phoenix market the most is the complete elimination of the AmeriDream and Nehemiah programs. Effective, October 1st – they are gone. Currently, those seller-funded down payment assistance home sales account for about half of all the homes being sold here. As a taxpayer, I can totally agree that there was a problem with seller-funded down payment programs (they have 4X the default rate of other FHA loans). But was now, of all times, when it had to go away? Homeowner Rescue Bill. Really? Posted in Home Values, Market Stats1 Comment on The Homeowner Rescue Bill Rescues Fannie and Freddie Investors.